Dedicated to educating our customers on reaching a "Smart Tan" with moderate indoor tanning to maximize the benefits of UV light while minimizing the risk. Serving up delicious sandwiches, burgers, paninis, and fried pickles to Wichita and the surrounding area. Providing Wichita with the pleasures of the European Bakery Experience for over 30 years. Honest opinions... Complete auto service, repair, oil and lube, computer diagnostics. Enjoy a taste of the good life with our fresh, homemade and traditional Italian cuisine! A gated apartment community featuring spacious one and two bedroom units. Located in northwest Wichita. Our hotel is close to Hartman Arena, Koch, Johnson Controls, WSU, and 10 minutes from downtown Intrust Bank Arena! Retail wine, spirits & beer in Old Town. Great prices! The world at your feet at a rock-bottom price. Wichita Hardwood floors, carpet and more. It is important to have a professional bondsman you can trust. A resident-led organization working to grow our local biking, walking and active transportation community. Live on a well-stocked fishing lake with sandy beaches and boat access conveniently located in southwest Wichita. Gorgeous custom homes built by Bob Cook Homes. Superior craftsmanship goes into each and every design. Did you know that the digestive system is the center of all health or illness in the body? When it comes to accounting full time or part time, ongoing or temporary, your place or ours, tell us what you need and when, and we’ll be there for you. Brentwood Apartments fit today's lifestyles for luxurious living and all-around everyday fun and enjoyment. Local beer, handcrafted burgers, local flavor. Bricktown Brewery brings great food, great beer and a great experience to Wichita. Medical products and delivery for most home treatments and rehabilitation programs such as power chairs, wheelchairs, hospital beds, portable oxygen and more. 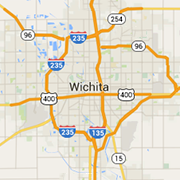 Providing Residential & Commercial HVAC Sales & Services in the Greater Wichita, Kansas area. A full service commercial and residential real estate company serving Wichita's needs for more than 60 years. Exceeding your Wichita real estate expectations for residential, new construction, and resale homes for Buyers and Sellers. Join our family and enjoy a home-cooked, comfort food style meal made only from scratch ingredients. CAC is an industrial and commercial mechanical contractor specializing in plumbing, piping, heat/air, and fire protection, and offering 24/7 service.